Som et led i FN's kulturtiår 2000-2010 publicerer Fredsakademiet en række sange om krig og fred fra forskellige kulturer. Hovedvægten af sangene er dog skrevet og komponeret efter første verdenskrig. Der er enkelte faktuelle oplysninger og kilder til sangenene og viserne, men ikke litterære analyser. Ydereligere oplysninger om sangenene, forfatterne, komponister og indspilninger modtages med tak. Det samme gælder for forslag til nye sange i sangbogen. As part of the UN Peace Culture Decade 2000-2010 the Peace Academy, publishes a series of songs about war and peace from different cultures. The main focus of the songs is written and composed after the First World War. There are some factual information and sources to the songs, but not literary analysis. Provisions of additional information about songs, sources, authors, composers and recordings are received with thanks. The same applies to proposals for new songs in the songbook. A Dear John Letter eller Dear John - Tekst og musik: Billy Barton, Fuzzy Owen & Lewis Talley, 1953. Jean Shepard, Ferlin Husky - A Dear John Letter, 1953. Indspillet på dansk af Jørgen Ingmann og Birthe Buch på 78'er som Kære John (Talley -- Owen -- Knud Pheiffer) / Indiana (James F. Hanley -- Otto Leisner). 1954, Metronome B 1077. En af de få fredssange med afsæt i Koreakrigen. / One of the few peace songs based on the the Korean War. And The Band Played Waltzing Matilda - Tekst og musik: Eric Bogle, 1971. Sunget i marts 1975 af June Tabor i BBCs Radio 1 John Peel session - udgivet på Airs and Graces, 1976. Året før havde den irske folkesanger John Currie udgivet sangen på en singelplade. Senere indspilninger: The Bushwackers Band, the Dubliners 1979 , the Skids 1981, Doug Ashdown 1981, the Pogues 1984, John McDermott 1992, Joan Baez 1995, Ethan Daniel Davidson 2002 og Johnny Logan & Friends. Oversat til dansk som: De Spillede "Waltzing Mathilda". Indspillet af Jens Memphis på Ingenmandsland, 1983. Arthur McBride eller Arthur McBride and the Sergeant - tekst og musik ukendt. Før 1867. Roud #2355. Indspillet af Martin Carthy på Prince Heathen, 1969. At Route 1 Box 144. Tekst og musik Johnny Cash. Hello, I'm Johnny Cash, 1969. Billy Boy - Tekst: the Almanac Singers. Musik: Child #12. 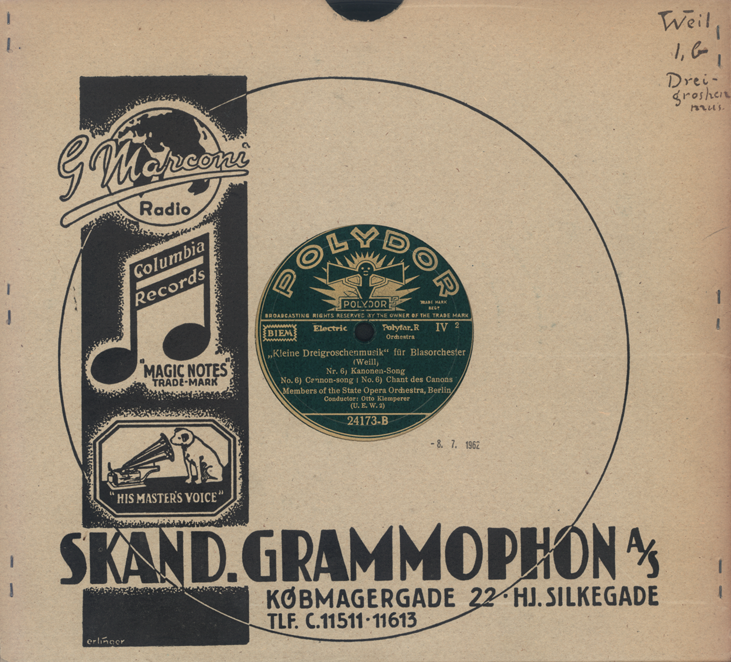 Indspillet på Songs for John Doe, 1941. Også indspillet instrumentalt på dansk af Raageleje Jazz i 1960 på en postkort grammofonplade udgivet af Danmarks Socialdemokratiske Ungdom / Also recorded instrumental in Danish by Raageleje Jazz in 1960 on a now rare postcard phonograph record released by the Danish Social Democratic Youth. Blood on Your Hands - Tekst og musik: Charlie & Craig Reid. Indspillet af The Proclaimers på Born Innocent, 2003. Break the News to Mother - Words and Music by Charles K. Harris, 1904? Sister Rosetta Tharpe ; the Dependable Boys and Sam Price Trio. The Elephant Song / Elefantsangen - Tekst og musik: Hans van Hemert. Sang: Kandiah Kamalesvaran, 1975. Dansk indspilning Henning Vilén samme år. 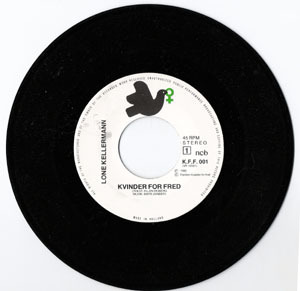 Fredens duva / Fredens Hvide Due - Tekst og musik: J. C. Ericsson. Happy Xmas (War Is Over) - Tekst og musik: John Lennon, 1971. Indspillet af by John & Yoko/Plastic Ono Band med the Harlem Community Choir. High Germanie [Germany]. Sang: Ewan MacColl. Tekst: William Motherwell (1797-1835), and probably inspired by the traditional song 'High Germanie' (Roud Folk Song Index no. 904). Motherwell, William: O WAE be to the orders / The Wars o' Germanie. I: Poems, Narrative and Lyrical. - Boston, W. D. Ticknor & Company, 1844. - s. -172. I Feel Like Im Fixin To Die Rag. - Tekst og musik: Country Joe McDonald. Welcome to Country Joe McDonald 1968-2005. Kanonensong - Instrumental udgave fra Die Dreigroschenoper / Laser og pjalter af forfatteren Bertolt Brecht og komponisten Kurt Weill, 1928. Members of the State Opera Orchestra, Berlin Conductor Otto Klemperer. Kleine Dreigroschenmusik Für Blasorchester (Weill): Nr. 6 Kanonen-Song / Cannon Song No. 6 / Chant des Canons. Polydor 24173-B - Polyfar R IV 2. Værkets originaltitel: Kleinen Dreigroschenmusik für Blasmusikensemble, Schlagzeug, Banjo und Klavier, 1928. 'Musical Comedy in three acts, German libretto by the composer and Bertolt Brecht, in collaboration with translator Elisabeth Hauptmann, adapted from John Gay's The Beggar's Opera. Conductor: Wilhelm Brückner-Rüggeberg. Günther Arndt Choir, Berlin Radio Symphony Orchestra', 1958. Litteratur: Hellmut kotschenreuther: Kurt Weill. (1962). Let Us Have Peace - Tekst og musik: William Shakespeare Hays, 1861 - Louisville, Ky. : Louis Tripp, 1869. - Let the cannon's roar be heard no more. And let the war cry cease. Lili Marleen - tekst: Hans Leip, 1915 - Musik: Norbert Schultze 1937-1938. Indspilning 1939. Mrs. McGrath, Mrs. McGraw, The Sergeant and Mrs. McGrath eller My Son Ted - Tekst og musik ukendt. Før 1814. Mutually Assured Destruction (M.A.D.) - Tekst og musik: Ian Gillan et al. Indspillet på Mutually Assured Destruction/The Maelstrom, 1980 UK Virgin VS 103. Noget om helte - tekst: Halfdan Rasmussen, Politiken, 17. april 1955. Musik: Mogens Jeremiin-Nissen. Og derfor bli'r den staaende paa Stedet, hvor den staar - Tekst: Epe og Poeten. Sang Osvald Helmuth. Opført på Dagmar Teatret, 1947. Førstelinie: "I Skoven sku' vær' Gilde, min Brud og jeg sku' med"
Peacemaker's Hornpipe (Ryth Wyth). Performed by Jerald Franklin Archer, Violin. Pershing Lied, Im dunklen Wald - Anonym 1983? Protect and Survive - Tekst og musik: The Dubliners. Indspillet på 25 Years Celebration, 1987.
modnes i lykke som rugen og hveden. brænde vor stue og adsplitte reden. Ingen skal røve os retten till freden! Poesi og politik : 18 udvalgte digte / Otto Gelsted. [Valby] Danmarks Kommunistiske Parti, Valby Distrikt, (1982) - 59 s.
Ring out, sweet bells of peace - Tekst: William Henry Gardner. Musik: Caro Roma / Clarence Whitehill, 1919. Tavs besked - tekst: Jeronimus M.
Tre soldater gik en tur - Tekst: Louis Levy, 1936. Sang: Aase Ziegler, Polyphon X 51351, 1950. Indspillet på Songs of the Civil War. Produced by Irwin Silber. Smithsonian/Folkways FH 5717, 1960. Unknown Soldier - The Doors, 1968. Publiceret i Pop tekst 2. Dacapo musikforlag, 1968. The Unknown War Criminal. Tekst og musik: Gerry Dempsey, 2005. Vietnam War Again. - Tekst og musik: Country Joe McDonald. War song eller "The Texas Ranger(s)" - tekst og musik ukendt. Before we reached the station, "I guess we'll have to fight." I feel that at this moment it is my time to die. "You're going off with strangers; at home you'd better stay." My mind was placed on rovin', and I was bound to go. Perhaps you have a sweetheart, to weep and mourn for you. If this be your condition, . . . I advise you by experiment, you 'd better stay at home. We Dinna Want Polaris - Tekst og musik: Glasgow Song Guild. Indspillet på “Ding Dong Dollar: Anti-Polaris and Scottish Republican Songs”, Folkways Records, 1962. 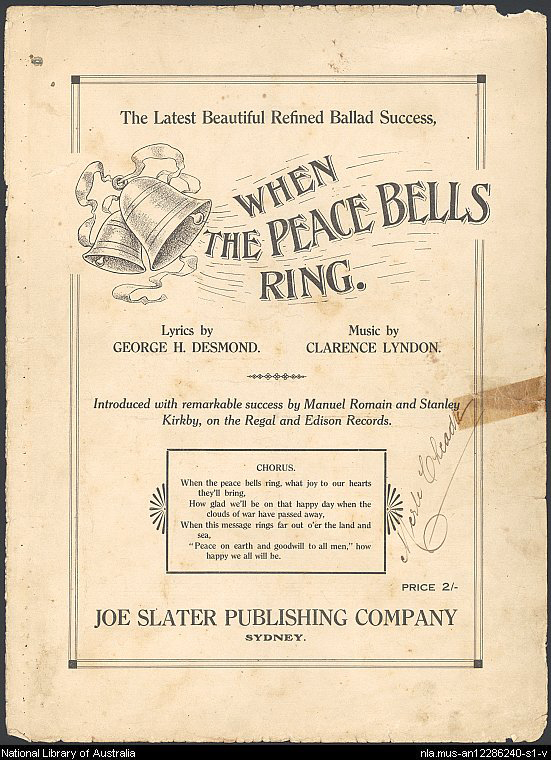 When the Peace Bells Ring - Tekst: George H. Desmond ; musik: Clarence Lyndon, 1916?. The Young Trooper Cut Down in his Prime - Tekst og musik: Ewan MacColl 1958. Indspillet af Ewan MacColl & Peggy Seeger på The Unfortunate Rake. Smithsonian/Folkways FH 3805, 1960. Fredsakademiets database over indekserede danske sange / Danish songs. 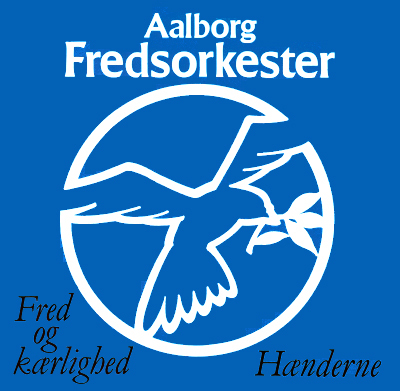 Fredsakademiets database over indekserede udenlandske sange / Songs in languages other than Danish. Arbejdernes Oplysningsforbund i Danmark: Arbejdersangbogen / AOF, 1926 ; 1978 : 1982 ; 1992. Bajer, Fredrik. 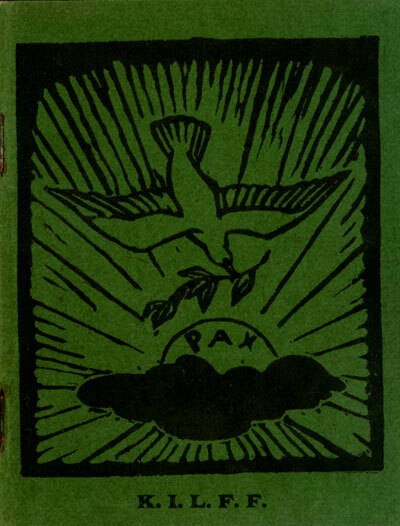 Syv sange ved skolemøder, 1872 - 8 s.
Campaign for Nuclear Disarmament: Songs for peace, nd. - København : Rasmussen & Olsens Bogtrykkeri, 1896 ; 1904. - 32 s.
- Berkeley: Own Publishing, 1917. - 16 pp. - London: C. W. Daniel, Limited, 1917. - 30 pp. Freds-sångboken / red. Råland Ginsburg. - Stockholm : Sveriges Utbildningsradio, 1982. - 96 s.
Les gloires de la paix. Chants destinés aux écoles. Publié avec l'approbation du Bureau international de la paix. / par Nicolo Ansaldi et par Mme. Albertine Ansaldi. - Genève : Impr. W. Kündig, 1903. - 31 s.
McVicar, Ewan: The Eskimo Republic : Scots political folk song in action 1951 to 1999. Norsk fredssangbog. Et udvalg af sange til brug ved møder for fredssagen. Samlet og udgit af Peder Christensen.Udateret. 46 s.
/ Jeff Harris (Compiler), Cliff Metzler (Compiler), Pete Seeger (Compiler) 2007, - 112 s.
Peace bells. Songs for the peace bands. Undated. 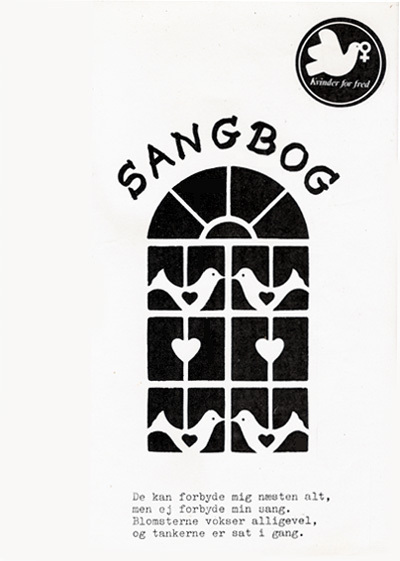 Ravnstrup kvindefredslejrens sangbog / The Women's Peace Camp at Ravnstrup Songbook . Sange. 4. nordiske fredsmode Skien 23. -25. juli 1901. Kra. 1901. 16 s.
Sange / Kampagnen mod Atomvåben. [uå], 1961? Sange / Kvindernes Internationale Liga for Fred og Frihed, 1949. Sanghefte / Fredsvennernes Hjælpearbejde / Peace Friends Relief Work. [uå], 19?? 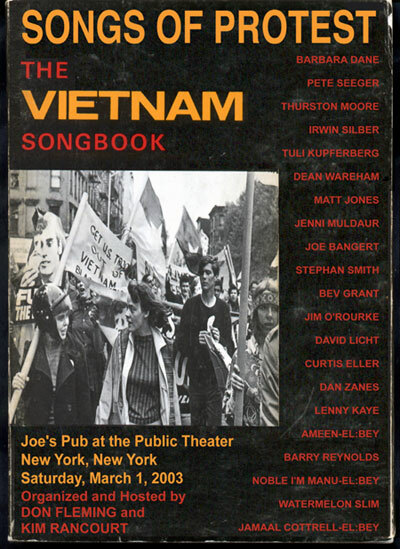 Student Peace Union: Songs for peace : 100 songs of the peace movement. 1966. Terp, Holger: Indledning til Fredssange : En dokumenteret spilleliste over 100 års musik: Samlet og dokumenteret af Holger Terp, Det danske Fredsakademi Juli 2014. Terp, Holger: Lili Marleens historie. Det danske Fredsakademi, 2014. - 17 s.
Terp, Holger: Skjalden sang fredssangen. Terp, Holger: World War One Songs: Collected and documented by Holger Terp, The Danish Peace Academy. July 2014. Un grande archivio di canzoni contro la guerra / A Great Archive of Songs Against War . Den formodentlig største samling af pacifistiske sangtekster på nettet. Public domain CD med sange om Irakkrigen. David Rovics: Live at University of Connecticut on April 2, 2006. No Nukes was a New York City Rally which took place in Times Sq., with a march following that went to the United Nations. It took place on May 2, 2010. The event called for No Nukes, No War. No Nukes is a 1980 documentary and concert film . Pacifica Radio Archives and The Polemic Consortium: Say It LOUD: New Songs For Peace. 'The Polemic Consortium is Mark Torres, Gomez, Bulldog Music composed by Gomez and Bulldog Mixed and produced by Mark Torres'. Wild Wimmin for Peace: [Music From] The Great Peace March, 1986. WW1 gave us some great poetic tributes. Ewan MacColl and Peggy Seeger, with the London Youth Choir: Songs Against the Bomb, 1959 or 1960, LP. Topic, 12001. Stamler, Paul J.: Tribute to Pete Seeger on his 90th birthday. No Time to Tarry Here, 2009.